1. Introduction The United Nation’s Development Agenda 2030 has put forward an ambitious set of Sustainable Development Goals (SDGs) to guide global development over the coming 15 years. The objective of this network brief is to demonstrate how the implementation of an economic citizenship strategy for children and youth can contribute to the achievement of many of the SDGs and corresponding sub-targets. In particular, financial inclusion and Economic Citizenship Education (ECE) for children and youth have a significant link to SDG #1, 3, 4, 5, 8, 10, 11 and 16. Therefore, it is beneficial for national policy makers and leading youth-serving organizations to take this document into account when determining what approaches they will take to satisfy the UN Development Agenda 2030. Financial inclusion and financial, social, and livelihoods education (the three components that make up the holistic learning framework of ECE) should be considered a long-term strategy for sustainable youth development, and one that can fit within the framework of the Development Agenda 2030. 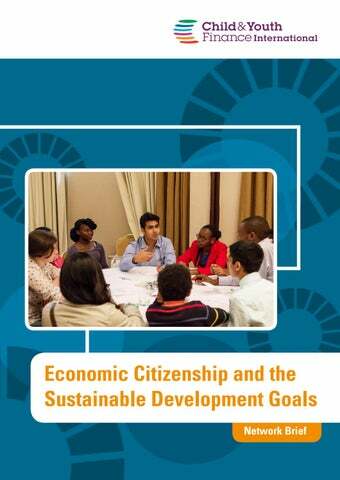 This document will therefore explain how the complementary nature of each of the elements of economic citizenship can contribute to the achievement of the relevant SDGs and corresponding sub-targets. 2. CYFI and the Model of Economic Citizenship Child and Youth Finance International (CYFI) is a non-governmental organisation that leads the world’s largest Movement dedicated to enhancing the financial capabilities of children and youth. This Movement is comprised of national authorities, financial service providers, civil society organizations, multilateral agencies, academic institutions and young people from around the world. CYFI supports the idea that all children and youth must have the possibility to realize their full potential as economic citizens. Economic citizenship is fundamental for the well-being of young people but also for the prosperity of households, communities, and countries. Children and youth represent the future economic actors that will influence the future of local and global economies through their financial decisions. CYFI’s main objective is to give all children and youth the opportunity to make wise financial decisions, accumulate savings, secure a meaningful and sustainable livelihood and break the cycle of poverty. CYFI defines economic citizenship as economic and civic engagement to promote sustainable livelihoods, economic and financial well-being, reduction of poverty and rights for, and responsibilities to, self and others. Economic citizenship has the potential to improve economic and social well-being, increase economic and social engagement, enhance understanding of and respect for basic rights, reduce income and asset poverty, and lead to sustainable livelihoods for children and youth. Furthermore, the model of economic citizenship consists of four components: financial inclusion, financial education, social education and livelihoods education. These components are the building blocks of empowerment and financial capability that underpin economic citizenship for children and youth. In 2012, the CYFI Academic Working Group established the CYFI Model of Economic Citizenship which is displayed in Figure 1 below. 3. The Sustainable Development Goals The 2030 Sustainable Development Agenda was agreed by world leaders on 25 September 2015. The Agenda is grounded in the Universal Declaration of Human Rights. It includes a set of 17 sustainable development goals (SDGs) and 169 subtargets which will guide development strategies and policymakers for the next 15 years, starting from 1st January 2016. These goals are universal, involving both developing and developed countries in the same manner. They are built upon the Millennium Development Goals (MDGs), which were adopted in the context of the United Nations Millennium Declaration. The MDGs led to improvements in several areas, such as reduction of poverty, access to improved sources of water, primary school enrolment and child mortality. 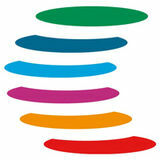 However, the Sustainable Development Agenda aims to go beyond the MDGs. It states that, “alongside continuing development priorities such as poverty eradication, health, education and food security and nutrition, the Agenda sets out a wide range of economic, social and environmental objectives. It also promises more peaceful and inclusive societies.” 6 Last but not least, the Agenda defines the means of implementing the SDGs. All SDGs are both integrated and interdependent, balancing the three dimensions of sustainable development: the economic, social and environmental. UN Member States recognised that the SDGs should be met for all nations and people and for all segments of society and that those who are furthest behind should be reached first.7 This led to the commitment that all vulnerable categories and different segments of society would be taken into account: children and youth, persons with disabilities, people living with HIV/AIDS, older persons, indigenous peoples, refugees and internally displaced persons and migrants. CYFI believes that eight of the SDGs are particularly relevant to economic citizenship for children and youth, which will be further explored in this document:  SDG 1: End poverty in all its forms everywhere.  SDG 3: Ensure healthy lives and promote well-being for all at all ages.  SDG 4: Ensure inclusive and equitable quality education and promote lifelong learning opportunities for all. Although the link between economic citizenship and health may not appear immediate, there are important connections to consider. One’s economic condition, income, working position, education and culture are all distal determinants of health and well-being. and gain practical entrepreneurial and employability skills in order to take advantage of economic opportunities within their community.” 21 Social and financial education can bring improvements in ensuring that all young people, both male and female, achieve literacy and numeracy (SDG 4.6). By understanding their rights and responsibilities, youth can become more aware of the importance of going to school and obtaining a basic education. In addition, financial education also enables children to not simply acquire knowledge, but also to apply their skills in a worthwhile manner. Notably, there is a range of recent studies that show the positive effects of financial education on financial knowledge and behaviour of children and youth.22 Social education can significantly improve some learning areas and build capabilities in present and future generations, allowing them to better understand, value and contribute to the world in which they live. Social and life skills education is also central to global citizenship. When young people learn about their rights and responsibilities, they are more likely to respect the rights of others and work together to build a better world. In other words, social education develops respect for diversity, empathy, peace, non-violence and social and economic justice (SDG 4.7). Financial inclusion strategies with proactive outreach to vulnerable and disadvantaged groups, as advocated in CYFI’s Child and Youth Friendly Banking Principles, contribute to SDG 4.5 in eliminating gender and other socioeconomic disparities in educational attainment. Combined with ECE at an early age, financial inclusion can empower children and youth to assert their rights, take control over their own futures and contribute positively to the society. Taken together, these components help young people to overcome socioeconomic and financial barriers to education. Through livelihoods education, youth can develop their employability skills, thus increasing the productivity of labour-intensive sectors (SDG 8.2). ECE seeks to inculcate children and youth with the skills needed to become inspired and empowered social entrepreneurs within their communities. Children and youth that acquire entrepreneurial capabilities can support innovation within the overall economy, bringing fresh ideas and new approaches. The current employment situation is becoming critical, especially for younger generations. To illustrate, in 2015, the official global youth unemployment rate was 14 percent, compared to only 4.6 percent for adults.32 A lack of relevant skills and the absence of access to appropriate financial services for entrepreneurs are two common barriers to youth employment. Greater financial inclusion and ECE, and their promotion through regional and national initiatives are tools to overcome these challenges. The vast majority of children and youth require employability skills that both make it easier to secure a job in the short term and provide financial stability in the long run. Youth who are exposed to ECE will develop the desired skills and knowledge to secure employment or become self-employed. Greater access to formal financial services can help pave the way towards employment, entrepreneurship and investment opportunities, allowing young people to build their assets and invest in their own futures. At the same time, by increasing the financial and business knowledge of children and youth, young people are presented with an opportunity to create sustainable livelihoods, stimulate entrepreneurial activities, and enhance their level of employability (SDGs 8.3-8.5-8.6). Through social education, young people develop greater self-efficacy, empathy and confidence in their ability to take control of their social and economic lives. While the proportion of adults not holding a bank account around the world has decreased to 38 percent in 2014, this still leaves 2 billion people excluded, a majority of them being women and the poor.33 Supporting children and youth in gaining access, knowledge and experience with banking products will improve their financial capabilities later in life, making them more attractive customers for banks. In this regard, the application of the Child and Youth Friendly Banking Principles, which advocate a proactive outreach by banks to unbanked young people, can encourage banks to offer access to financial products for the next generation (SDG 8.10). In order to create safe, resilient and sustainable settlements and cities, it is essential to include children and youth in urban development strategies. Concentrating on urban youth development is important as the proportion of young people in urban populations is likely to increase significantly by 2030, bringing additional challenges of unemployment and social and financial exclusion. Through the provision of financial knowledge and economic opportunities, young people will be able to build sustainable jobs and livelihoods for themselves as they will have access to the resources and knowledge needed to financially empower themselves. To promote sustainability, children and youth should be provided with a safe space to meet and work, and access to adequate public goods so that they can improve their overall living standard and contribute to the development of society. Engaging youth through financial inclusion, financial education and livelihoods education makes the goal of creating sustainable and safe cities more attainable (SDG 11.3). Furthermore, financial education should not be limited to simply teaching children and youth how to master financial systems, earn returns on investment or start successful businesses. Rather, it should be also grounded in ethical and ecologically responsible behaviour. Financial, social and livelihoods education empower individuals, not only in the way they see themselves, but also in the way they see other members of their communities.40 Moreover, it improves their confidence and capability to assert their rights, hold institutions accountable and participate in decision making. At the same time, social education plays an important role in steering children away from financial behaviours and attitudes that may negatively affect not only personal well-being but also that of the wider community. With ECE, young people are equipped with the knowledge and skills to hold government authorities, financial institutions and civil society organizations accountable for their actions and for their place in society. As a result, accountability and transparency becomes the norm, and not an option, for governments and organizations serving youth. The empowerment of children and youth provides a step forward to obtaining responsive, inclusive, participatory and representative decision-making at all levels. Economically empowered children and youth are better equipped to participate in the economic, social and political life not only at the community level but also at the national and international level, increasing their role as global citizens. Moreover, with their enhanced capabilities, they will be better placed to participate in local, national and international decision-making processes. 4. Conclusion Expanding financial inclusion and ECE for children and youth is crucial in creating future generations that are more empowered, engaged and aware of social and financial matters. With financial inclusion, children are able to lower the risk of exploitation and can build a strong asset base, complemented by financial literacy, social values and entrepreneurial skills. Quality ECE and appropriate financial services for children and youth around the world promote inclusive and sustainable development for the next generation of economic citizens. As demonstrated in this document, an economic citizenship strategy, which integrates a financial access with ECE, can contribute to achieving many of the SDGs and related sub-targets. A more detailed mapping of the components of economic citizenship (financial inclusion and financial, social and livelihoods education) and their relation to the SDGs can be found in Annex B. The need to invest in specific policies and programmes targeting vulnerable children and youth is clear and CYFI remains committed to promoting Child and Youth Friendly Banking and quality ECE in all parts of the world. Government authorities, financial institutions, and civil society organizations are key players in the effort to advance the United Nations Sustainable Development Agenda and should consider the benefits of integrated financial inclusion and ECE in order to reach these important SDGs. Dupas, P. & Robinson, J. (2013), 'Why Don't the Poor Save More? Evidence from Health Savings Experiments', American Economic Review, 103(4), 1138-1171. Retrieved from: http://web.stanford.edu/~pdupas/DupasRobinson_HealthSavings.pdf. Dutt, P. and D. Mitra (2008), ‘Inequality and the Instability of Polity and Policy.’ The Economic Journal, 118, 1285–1314. Elliott, W., & Beverly, S. (2011a). ‘Staying on course: The effects of assets and savings on the college progress of young adults’. American Journal of Education, 117(3), 343-374. Florez, A., & Jayaram, S. (2016). ‘Bridging the Skills Gap in Latin America and the Caribbean’. FHI 360, R4D. Washington, D.C. Retrieved from: http://youtheconomicopportunities.org/sites/default/files/uploads/resource/LAC%20Skills%20Gap.pdf?platform=hootsu ite Greenwood, J., and B. Jovanovic (1990), ‘Financial Development, Growth, and the Distribution of Income.’ The Journal of Political Economy, 98(5), 1076–1107. International Finance Corporation (2011), ‘Strengthening Access to Finance for Women-Owned SMEs in Developing Countries.’, retrieved from: http://www.ifc.org/wps/wcm/connect/a4774a004a3f66539f0f9f8969adcc27/G20_Women_Report.pdf?MOD=AJPERES IPA (2015). ‘Evidence in Financial Inclusion (Brief)’. Retrieved from: http://www.povertyaction.org/publication/evidencefinancial-inclusion Klapper, L., El-Zoghbi, M., & Hess, J. (2016), ‘Achieving the Sustainable Development Goals. The role of financial inclusion’, Washington, D.C.: CGAP, retrieved from: https://www.cgap.org/sites/default/files/Working-Paper-AchievingSustainable-Development-Goals-Apr-2016.pdf Lee, Y., Johnson, L., Sherraden, M., Ansong, D., Osei-Akoto, I., & Chowa, G. (2015). ‘Taking the Bank to the Youth: Impacts on Saving and Asset Building from the Ghana YouthSave Experiment’. Retrieved from: http://csd.wustl.edu/Publications/Pages/DisplayResultItem.aspx?ID1=1264 MasterCard Corporation & CYFI (2014), 'Banking a New Generation, developing responsible retail banking products for children and youth'. Retrieved from: http://www.childfinanceinternational.org/resources/publications/2014-banking-anew-generation.pdf . MasterCard Foundation (2015), ‘Financial Services for Young People: Prospects and Challenges’. Retrieved from: http://www.mastercardfdn.org/wp-content/uploads/2015/08/Youth-Financial-Services.pdf OECD (2015), ‘Skills for Social Progress: The Power of Social and Emotional Skills’, OECD Skills Studies, OECD Publishing. http://dx.doi.org/10.1787/9789264226159-en Omunjalu, B.S. & Fondo, F. (2014), ‘The Role of Microfinance in Economic Empowerment of the Youth’, IOSR Journal of Business and Management, 16(5), 26-32. Retrieved from: http://iosrjournals.org/iosr-jbm/papers/Vol16-issue5/Version1/E016512632.pdf O'Prey, L. & Shepard, D. (2014), 'Financial Education for Children and Youth: A Systematic Review and Meta-analysis', Aflatoun Working Paper 2014.1C . Retrieved from: http://www.aflatoun.org/docs/default-source/aflatoun-secretariatevaluation/financial-education-for-children-and-youth---systematic-review-and-meta-analysis.pdf?sfvrsn=10. Scanlon, E., & Adams, D. (2009). “Do assets affect well-being? Perceptions of youth in a matched savings program”. Journal of Social Service Research, 35(1), 33- 46. Population Council (2011), 'Siyakha Nentsha: Building economic, health, and social capabilities among highly vulnerable adolescents in KwaZulu-Natal, South Africa '. Retrieved from: http://www.popcouncil.org/uploads/pdfs/TABriefs/04_SiyakhaNentsha.pdf. Explanation FI: Evidence has shown that FI leads to an increased economic and financial well-being for children and youth. This a higher level of income, saving and the acquisition of household assets.414243 Moreover, financial inclusion can lead young people out of poverty traps.444546 FE: Promoting FE for children and youth is essential to developing a financially responsible generation able to take greater control over their financial futures by learning to mitigate financial risks, budget accordingly and becoming informed consumers. 4748 SE: Social values learned through SE help young people overcome financial and social challenges, improving their capability to deal with difficult situations. Explanation Economic condition, income, working position, education and culture are all linked with better health and greater well-being. FI and FE: If youth are able to accumulate assets, it will enhance their socio-economic empowerment increasing their ability to delay marriage and devote more resources to healthcare expenses.56 SE: Helps younger generations to be more informed and aware of sexual and reproductive health, thus reducing the risk of a premature pregnancy and death during childbirth.57 The development of personal and interpersonal skills has also shown to empower young women and reduce early pregnancy rates. 3.5 Strengthen the prevention and treatment of substance abuse, including narcotic drug abuse and harmful use of alcohol 3.8 Achieve universal health coverage, including financial risk protection, access to quality essential health-care services and access to safe, effective, quality and affordable essential medicines and vaccines for all. SE: Children are taught to identify their emotions and understand the consequences of failing to deal with them properly.66 SE: Brings more awareness of substance abuse in society and of the negative implications that alcohol and drugs can have. FE and LE: Contribute to the empowerment of young people, equipping them with marketable skills and giving them the possibility to better control their social and economic lives. FI and FE: Owning a savings account, and knowing how to use it, increases financial capability and economic security. Individuals with opportunities to save formally and informally can substantially increase investment in preventative health and reduce vulnerability to health shocks.67 68 69 SE: Exposure to basic health and safety through SE increases young people’s awareness of the importance of good health and the types of health services available. Explanation FI: Evidence shows that financial inclusion improves educational attainment and academic achievements.70 71 72 FE: Planning and budgeting helps young people save for higher education and vocational training programs LE: Encourages young people to map their future career goals and understand what educational channels are necessary to achieve these goals. LE: Builds sustainable livelihoods for youth through skills assessment and developing foundational skills for entrepreneurship and employability. LE also develops an understanding of employer and employee responsibility and the potential social and environmental impacts of enterprise. 75 FI: Evidence has shown that youth with savings are about twice as likely to be on course for educational achievement as their counterparts without savings. An asset base also reduces the fear that there will be financial barriers to higher education in the future.76 SE: A greater awareness of rights, and a respect for diversity and social justice, creates more participation among young people and calls attention to more inclusive systems. Young people will be inspired to campaign against discrimination and injustice in educational systems. LE: Entrepreneurial experiences in school allow young people to apply financial literacy and numeracy skills through individual and/or group based enterprise. FE: Developing financial literacy is central to making financially responsible decisions, living within ones means and achieving a sustainable livelihood.79 SE: Social and life skills education is central to global citizenship. When young people learn about rights and responsibilities, they are more likely to respect the rights of others and work together to build a better world. Develops a respect for diversity, empathy, peace and non-violence, and social and economic justice.80 LE: Develops skills and competencies in young people that can help them earn money ethically, sustainably and responsibly through either entrepreneurship or employment. Explanation FE and FI: Providing financial access and developing financial capabilities for young women and girls builds social and economic empowerment, allowing them to take advantage of greater economic opportunities alongside their male counterparts.8182 SE: Increasing awareness of their rights and responsibilities empowers women to take a stand against gender discrimination. Moreover, when young men and boys are taught to respect gender diversity and appreciate social justice they will be less likely to discriminate against women in the future. 8.3 Promote development-oriented policies that support productive activities, decent job creation, entrepreneurship, creativity and innovation, and encourage the formalization and growth of micro-, small- and mediumsized enterprises, including through access to financial services. FI: Young people can benefit from a range of appropriate financial services, learning when it is the right time to spend, save, borrow and share money. Financial Inclusion improves financial sector development and as such increases the growth rate.88 FE and LE provides young people with the means to develop financial and entrepreneurial competencies, improve their economic condition and contribute to the overall economy.8990 FE helps young people avoid falling into debt while making wise financial decisions that will provide for a secure financial future. Greater FI and FE, and their promotion through regional and national initiatives, will become the tools to overcome the lack of relevant skills and the lack of access to appropriate financial services for young entrepreneurs.91 FE and LE: Increasing the financial and business knowledge of youth enhances their opportunities to obtain sustainable livelihoods through entrepreneurial ventures and securing employment.92 Greater appreciation for the social impact of enterprise. Explanation Concentrating on urban youth development is important as young people are projected to make up nearly two thirds of urban populations by 2030, bringing with them challenges of unemployment and social and financial exclusion. FI and FE: When FI and FE is widespread, there is less probability that children and youth will engage in crime, gangs, and illicit economic activities, issues that are particularly problematic in urban settings. Young people become more resourceful, efficient and productive in their financial lives.101 SE: Contributes to the understanding of rights and responsibilities, respect for rules, empathy and conflict resolution, essential qualities for healthy, integrated and inclusive urban communities. LE: Young people will be able to secure sustainable jobs and livelihoods for themselves and others, as they will have access to the resources and knowledge needed to empower themselves financially and participate actively in market solutions for sustainable urbanization. FI: As young people become increasingly familiar with financial products and services they will demand more Child and Youth Friendly banking practices from their financial institutions, including responsible marketing, internal controls and fair pricing. FE, SE, LE: Young people are equipped with the knowledge and skills to hold government authorities, financial institutions and civil society organizations accountable for their actions and for their place in society. Accountability and transparency becomes the norm, and not an option, for governments and organizations serving youth. FI: As young people become a more important client segment for financial services providers, the demand for their input on product design and evaluation will increase. Financial institutions will be pressured to be more responsive and accommodating to the interests of young clients. FE, SE, LE: Socially and economically empowered children and youth will increase their participation in economic, social and political life, not only at the community level but also at the national and international levels. Moreover, with their enhanced capabilities, they will be better placed to participate in local, regional and international decision-making processes.